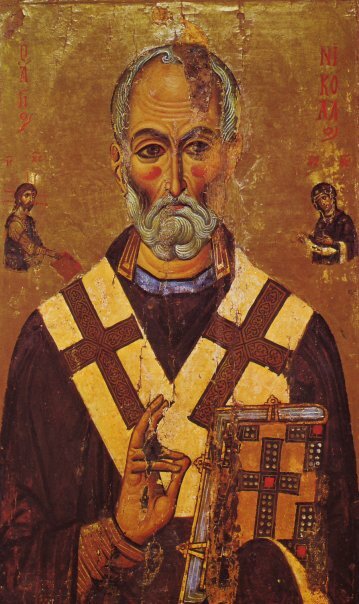 Chosen Wonderworker and superb servant of Christ, who poured out for all the world the most precious myrrh of mercy and an inexhaustible ocean of miracles, I praise you with love, Saint Nicholas; and as you have boldness towards the Lord, deliver me from all adversities that I may call to you: Rejoice, Great Wonderworker Nicholas! Seeing the flow of the myrrh, O divinely wise Saint, our souls and bodies are enlightened, and we realize that you are a wonderful, living source of unction, O Nicholas. For you refresh with miracles as with waters poured out by the grace of God those who faithfully cry to Him: Alleluia! Rejoice, firm stronghold of Orthodoxy. Rejoice, for through you faith is strengthened. By the power given you from on high you dry every tear from the face of those in terrible suffering, O God-bearing father Nicholas. For you are a feeder of the hungry, a superb pilot for those on the high seas, and a healer of the sick, and you have proved to be a helper to all who cry to God: Alleluia! A storm of bewilderment confuses my mind. How can we worthily sing of your miracles, O blessed Nicholas? For no one could count them, even if he had many tongues and the best will in the world. But we boldly too sing to God who is wonderfully glorified in you: Alleluia! You appeared as a God-ward racing star, guiding those in distress at sea, who were once threatened with imminent death if you had not come to the help of those who called upon you, O wonderworker Saint Nicholas, for you forbid the flying devils who shamelessly wanted to sink the ship, and you drove them away, and taught the faithful to cry to God Who saves through you: Alleluia! The whole world proclaims you, blessed Nicholas, as a quick intercessor in adversities; for frequently you precede those traveling by land and those sailing on the sea, and help them in a single hour, keeping from evils all who cry to God: Alleluia! Wishing to dispel the blasphemous stench of heresy you appeared as a truly fragrant, mystical myrrh, O Nicholas. By shepherding the people of Myra, you filled the whole world with your gracious myrrh. And dispelled from us the stench of sin hateful to the Divine mind, that we may acceptably cry to God: Alleluia! 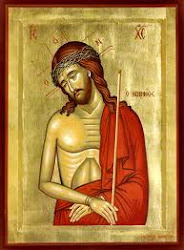 Your holy church proves a strange wonder to those who flock to you, blessed Nicholas; for by offering in it even a small prayer, we receive healing from great illnesses, if only, after God, we put our hope in you and faithfully cry: Alleluia! Allay all our pains, O our great intercessor Nicholas, and grant gracious healings to delight our souls and rejoice the hearts of all who run fervently to you for help and cry to God: Alleluia! Wishing to save your soul, you truly subjected your body to the spirit, O our Father Nicholas. For by silence first and by wrestling with thoughts, you added contemplation to activity; and by contemplation you didst acquired perfect knowledge with which you boldly conversed with God and the Angels, always crying: Alleluia! Your life was a song to the Most Holy Trinity, surpassing others in thought, word and deed, O Most blessed Nicholas. For with much research you explained the precepts of the true faith, teaching us to sing with faith, hope and love to the one god in Trinity: Alleluia! Knowing the grace that has been given to you by God, we joyfully celebrate your memory, most glorious Father Nicholas, and with all our soul we crave your wonderful intercession. Unable to count your glorious deeds which are like the sand of the sea and the profusion of stars, in utter bewilderment we cry to God: Alleluia! O Most holy and wonderful Father Nicholas, comfort of all in sorrow, accept our present offering, and pray to the Lord that we may be delivered from Gehenna through your gracious intercession, that with you we may sing: Alleluia! O Holy Hierarch Father Nicholas pray unto God for us. granting to them a place of brightness, a place of rest, a place of refreshment, where there is no sickness, sorrow, or sighing, but where the sight of Your Face brings joy to Your saints from all the ages. Grant them Your Kingdom, and a portion of Your eternal blessings, and the enjoyment of Your unending Life. Deliver all of us from all evil through your help, blessed Father Nicholas; for we know that the prayer of a righteous man is a great and potent force for good. Next to the Most Blessed Theotokos, we have you as a righteous intercessor with the All-Merciful God, and to your fervent intercession and protection, most gracious Father, we humbly have recourse. Keep us, as a watchful and good shepherd, from all enemies, from pestilence, earthquake, hail, famine, flood, fire, the sword, invasion of enemies and civil war, and in all our adversities and afflictions give us a helping hand and open the doors of God's mercy; for we are unworthy to behold high heaven on account of the multitude of our sins; we are bound by the bonds of sin and have not done the will of our Creator nor kept His commandments. Therefore, in repentance and humility, we bow the knees of our hearts to our Maker, and entreat your fatherly intercession with Him. Help us, Saint of God, lest we perish with our sins; deliver us from evil and from every hostile power, direct our minds and strengthen our hearts in true faith which, through your intercession, neither wounds, nor threats, nor epidemics, nor the wrath of our Creator shall lessen; but grant that we may live a peaceful life here and that we may see the good things in the land of the living, glorifying the Father, the Son and the Holy Spirit, one God worshipped and glorified in Trinity, now and ever, and unto ages of ages. Amen. Wisdom, Most Holy Theotokos save us. More honorable than the Cherubim, and more glorious beyond compare than the Seraphim. Without defilement you gave birth to God the Word. True Theotokos, we magnify you. Glory to you O Christ, our God and our hope, glory to You. Αναρτήθηκε από amphilochios στις 6:54 μ.μ.